I often struggle with visiting animals in captivity. Rescuing injured animals and having children, has given me an opportunity to see things through a different lens. Animals living in captivity often provide enriching experiences for both the animal and human. I am on a constant quest to find moments that provide an opportunity to connect with creatures that live in our natural world. Animal Adventures in Bolton, MA, provides this type of unique opportunity. It is home to many exotic animals and reptiles from all over the world. 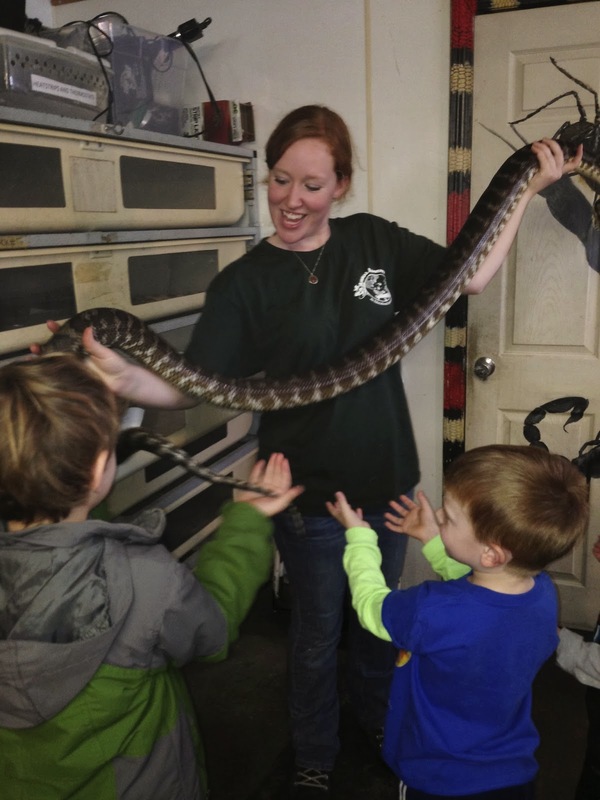 The first noticeable difference is that these exotic animals and reptiles connect with people. A rare experience like no other. How does this happen? I learned that not a single animal that lives on the premise is wild caught. They are rescued from situations such as abandonment, being orphaned or neglected. I observed that they are given a wonderful life and are being used to educate. A win/win situation! Our tour lasted two hours and during that time we saw a variety of animals, birds and reptiles from all over the world. Our guide was well educated and able to talk about every single animal. We were able to witness the gentleness of their lynx, learning that the adornment on this ears are for warmth. We met an adorable fox that is afraid of the dark and has a favorite stuffed animal. We also heard the soft cries of a little fox while she lay sleeping. We heard the amazing song of the kookaburra, did you know they are meat eaters? We heard that ferrets make great pets, a fact we already knew having owned several. We got to touch a skunk, tortoise, rabbit, lizard, boa and marvel at an anaconda! We also got to meet and learn about the habits of the ring-tailed lemur, misconceptions about them created by Hollywood were clarified. My children hung on every word that the guide spoke. They learned that it is not advisable to put a boa around your neck at a friends house and to always use caution when you come in contact with a wild animal. The best part of the experience is that you are able to interact with animals from all over the world. All creatures play an important role in our natural world, there are many that are misunderstood and even feared and killed out of that fear. The opportunity that Animal Adventures provides gives a unique prospective on these animals and connects you to them in ways that would never happen in their natural environment. It is important to keep in mind when visiting that you are not going to a zoo, aquarium or museum. It is a home for abandoned animals and it is growing and evolving. All the animals have ample space and are taken care of and interacted with daily. While some of their enclosures may not look as posh as your local zoo, they are sufficient and appropriate for their individual needs. The animals all have time out of their habitats to interact and provide educational experiences. We were told that the kangaroo gets to spend play time with the owner and that the owner says good night to all the creatures. An example of the love and devotion to the inhabitants of this very special place. In addition to the Bolton, MA location, Animal Adventures can be found at Kimball Farm in Westford during spring, summer and fall. We were able to visit them over the summer at Kimball Farm and enjoyed the animals and presentation that they had at the farm.